IT’S THE MOST WONDERFUL TIME OF THE YEAR! TOMORROW IS “ARIZONA GIVES DAY”! On Arizona Gives Day, Arizonans will come together to support their favorite causes. This 24-hour, statewide campaign, on April 3rd, helps to raise awareness about nonprofits in Arizona and the role they play in making a difference in our community. Arizona Gives Day has helped raise over $10.1 million for the nonprofit sector of Arizona. It helps inspire individuals to give generously to the causes they are passionate about. This day brings Arizona together to create a stronger community. As some of you may already know, we create life-changing friendships for children in central Arizona who are in need of a caring adult mentor. We know that a positive adult mentor can help make all the difference for these children. Ask your family, friends, and coworkers to consider making a personal donation. Share a message on your social media platforms about our campaign. Give us a follow at @BBBSAZ or ‘Like’ us on Facebook at ‘Big Brothers Big Sisters of Central Arizona’ to help share our messages throughout the day. 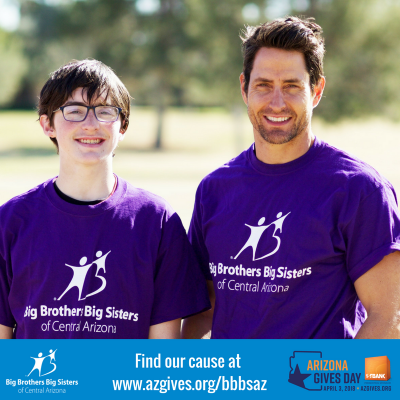 Create your own Arizona Gives Day fundraiser in support of Big Brothers Big Sisters on Facebook. We are excited for Arizona Gives Day and appreciate your support. Thank YOU for making the community stronger.